Geometry and rules as dominants at the expense of functionality and humanity, seems as an hazard in urban planning. Person as independent variable, as doubt becoming plan, is the way forward. Common places rise up from block, becoming a platform for utilisations , parks, open theatres, kindergartens. The platform contains the entrance in housing, belongs to habitants of the block and it’s the base for the vertical elements, in significant contrasts of shapes. The three residential towers seem to be in balance between the external simple volume, and the complexity of internal spaces, different size of the apartments and the distributions systems. Wooden cocoons make up the towers, contain group of floor different from one another in which the guide is the adaptability to needs. Every cocoon “matrioska” contains apartments, services as lavatories and other. 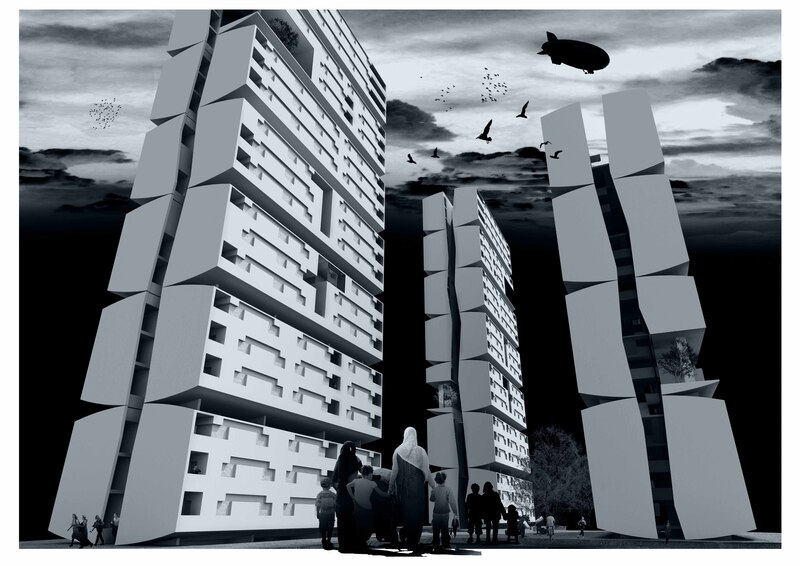 The towers as natural rocks, are fenced by fractures, distribution systems, which structure the apartments aggregation to two facades in able to guarantee natural insulations east/west.